The Standard Gauge Module Association (SGMA) is a non-profit group of toy train enthusiasts interested in designing and building modular display layouts to promote the hobby of Standard Gauge (2 1/8" gauge) tinplate toy train collecting and operating, and for the education and enjoyment of the general public. The SGMA has established a set of standards for the construction of modules. Membership in SGMA is open to Standard Gauge enthusiasts interested in building modules and/or operating Standard Gauge trains on SGMA display layouts. The Standard Gauge Module Association (SGMA) was organized in 2006 by hobbyists interested in designing, building and displaying modular layouts operating American tinplate toy trains in standard (2-1/8") gauge. A set of standards for the construction and wiring of modules was developed in 2006 during meetings and extensive online discussions. Module construction can be done using commercially available bench work as well as home made components. While the current membership of the SGMA is centered in the upstate New York, Mid-Atlantic and Midwest regions of the country, we welcome hobbyists in other areas of the country and encourage them to join in the construction of modules built to current SGMA standards and specifications. The first SGMA display took place at the Train Collector's Association (TCA) Eastern Division meet in October of 2006. 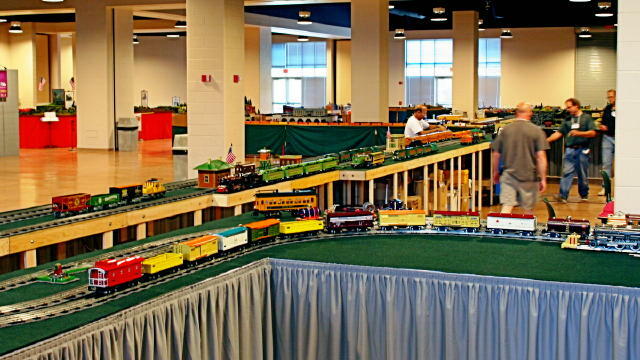 The SGMA followed up with an exhibit in August 2007 at the Toy Train Operating Society (TTOS) convention held in Altoona, Pennsylvania. A third exhibit was presented at the New York State Train Fair in Syracuse, NY in November 2008. Our fourth exhibit at the World's Greatest Hobby Show On Tour in Oaks, PA in January, 2009 was viewed by thousands as the two day show enjoyed a record attendance in excess of 40,000 people. Additional SGMA events are now in the planning stage. Click here for contact information or links to manufacturers of standard gauge trains and module construction supplies. The SGMA sponsors on online discussion group. Hobbyists with an interest in the SGMA are welcome to join. Click here to go to the SGMA Yahoogroups homepage. To view a comprehensive collection of photographs of SGMA meetings and events, click here. For more information, please click on this link to send us an email. © 2009 Standard Gauge Module Association - All rights reserved.